Nexus 6, the successor of the extremely successful Nexus 5, was launched recently on October 29, 2014. It ships with Android 5.0 Lollipop, the latest OS version. With a 2.7 GHz quad core processor and 3GB of RAM, the specifications are capable of putting any other high end smartphone to shame. As like other Nexus series device this phone features AOSP firmware that is slim and minimal for fast performance. You will fall in love with the enhanced fluidity and simplicity of Android 5.0 Lollipop. The Camera is awesome as well, it can click both full HD photos and Videos. You have a device which features the hardware that is yet to come to any other manufacturer. You are getting all premium hardware with Google’s services. Once you unlock your device and install recovery you will be available to overclock your device or install a kernel that will be better and blazing fast. We are providing below a detailed guide to unlock bootloader, install TWRP recovery and root Nexus 6 easily. Nexus 6 comes with a locked bootloader, to root or install recovery you will need to unlock this device. 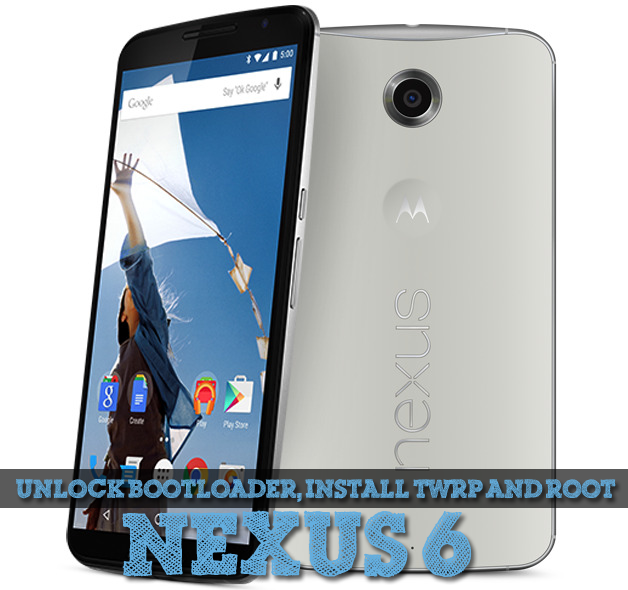 Here, we are providing a detailed tutorial to unlock bootloader of Nexus 6. Go to settings -> About Phone, and tap the Build Number repeatedly a few times till you enable developer options. Now go to Developer options, and tick the options – USB debugging and OEM unlock. Also, you need to have the Android SDK already installed on your computer, and you need to have a data cable to connect your Nexus 6 with PC. So, now that everything is ready, let the fun begin! When you connect your phone to the PC, you should tick the USB debugging option. Now, go to the folder where your SDK is located and then open a command prompt from within the Platform-tools SDK folder. You will get a confirmation page with warnings like your warranty will be void, all your apps will be wiped out etc. (You already knew this, right?). Confirm it with the power button. The unlocking procedure will be over in a few minutes, and you will be brought back to the same screen. However, this time, the message at the bottom will say device is unlocked. So now, disconnect your phone, reboot it, and finally you have successfully unlocked the Nexus 6 Bootloader! Note: For Mac users, you need to put a “./” before the commands(without the quote) for the commands to work. Rooting this phone is actually extremely easy, and the entire credit goes to developer Chainfire, who has created an awesome tool called CF Auto Root. This tool can easily root your Nexus 6 with just one click! You can download the tool here. So before starting, you need a few tools ready which you will need during the process. First enter Bootloader menu, by following step 1 of the previous tutorial. Extract CF Auto Root (that you have downloaded) to any folder that you want. You will find that there are 3 files for three operating systems – Windows, Linux and MAC, along with 2 folders as well. Run the root-windows.bat file if you are a Windows user (or the corresponding file), and a command prompt will appear. It will first try to unlock the Bootloader, but since that’s already done, it will simply continue with the rooting process. After it is done, the phone will reboot and your Nexus 6 will be rooted! You should find the SuperSU app in your app drawer. So now that the Bootloader is unlocked, you can install custom ROMs like Cyanogen MOD, Paranoid Android, MIUI etc. But before that, you need to install a custom recovery like TWRP recovery to help you make backups of system files and restore them, if needed. You will need to download the recovery image file from this website- Nexus 6 recovery image. It’s a small package, about 12 MB in size. Remember that this is only for Nexus 6, and must never be used on any other Android device or else your device might be bricked. The following steps will assist you in installing the recovery software. Switch off your Nexus 6 and press the volume down and power button simultaneously which will boot the device into the Bootloader menu, or you can follow step 3 in the above tutorial. Both will function perfectly. Now, open a command prompt just like the previous way. Next, transfer the downloaded file to the platform-tools folder. And you are done! You have successfully installed TWRP recovery on your Nexus 6. Hope you have understood the entire process. Just as I said, once you do these stuff a couple of times, these will seem really easy. Hope you have your unlocked and rooted Nexus 6 soon! Try the best icon packs on your Nexus 6.